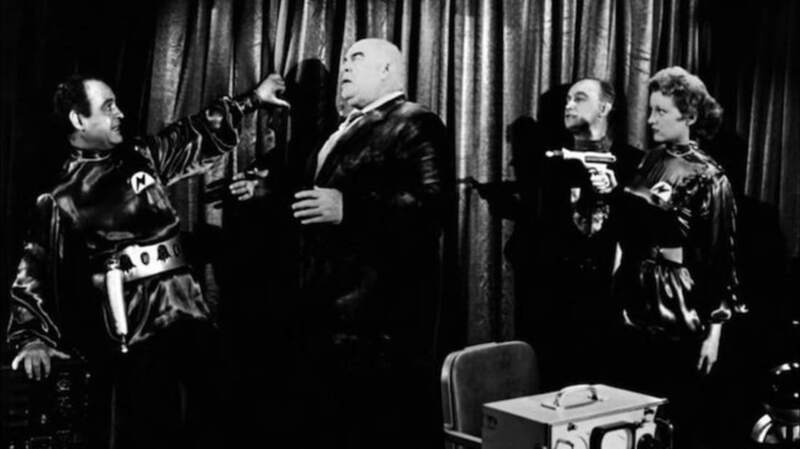 Whether it deserves the title or not, Plan 9 from Outer Space (1959) has been both condemned and celebrated as “the worst movie ever made.” Critics love to mock everything from the film’s comical dialogue to its not-so-special effects. And yet these same things are what endears the film to its legion of fans. Writer-director Ed Wood crafted the picture with undeniable passion. “Plan 9,” he once said, “is my pride and joy.” After Wood passed away in 1978, his beloved film turned into a huge success—but for reasons he probably never would’ve expected. 1. IT WAS BELA LUGOSI’S LAST MOVIE. A lifelong Bela Lugosi fan, Ed Wood was able to cast his idol in 1953’s Glen or Glenda. Two years later, the director gave him a Dr. Frankenstein-like role in Bride of the Monster. For his next film, Wood once again wanted Lugosi to take center stage. At the California home of Swedish wrestler Tor Johnson—who’d also appeared in Bride of the Monster—Wood shot a handful of very brief scenes, all starring Lugosi. Depending on who’s telling the story, this footage was either intended for Plan 9 or for an unmade movie called The Vampire’s Tomb. Regardless, Lugosi sadly didn’t live to see any of it reach the silver screen. The horror icon died of a heart attack in August 16, 1956. Endlessly resourceful, Wood threw all of his existing Lugosi shots into Plan 9 from Outer Space. 2. A CHIROPRACTOR PLAYED LUGOSI’S DOUBLE. Production on Plan 9 from Outer Space began in earnest after Lugosi’s death. Since he was no longer around to film certain scenes, Wood recruited chiropractor Tom Mason as a substitute. Physically, he wasn’t a perfect stand-in; Mason was noticeably taller than Lugosi (a fact that Wood tried to disguise by having him hunch over). But the good doctor made sure to mask his face under a cape at all times. 3. ITS ORIGINAL TITLE WAS DEEMED SACRILEGIOUS. The film, about aliens who try to conquer Earth by reanimating human corpses and turning them against the living, was given the working title Grave Robbers from Outer Space. But most of the movie’s funding came from J. Edward Reynolds, a devout Southern Baptist, whose religious sensibilities were offended by the title. So Wood changed it to Plan 9 from Outer Space. To further improve his relationship with the financier, Wood underwent a full-body baptism at Reynolds' church. Several cast members did likewise—including Johnson, who pranked the minister by pretending to drown mid-ceremony. 4. IN SOME VERSIONS OF THE FILM, YOU CAN SEE THE SHADOW OF A BOOM MIKE IN THE BACKGROUND. Perhaps unsurprisingly, Plan 9 has numerous bloopers. For example, the grave scenes use plywood tombstones, which wobble throughout the movie. But Wood’s team wasn’t responsible for every error. Early on, we see our hero—pilot Jeff Trent—flying a plane when a huge burst of light almost blinds him. 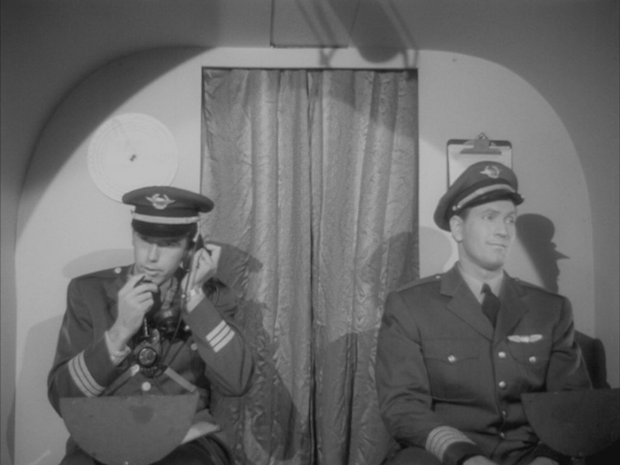 Viewers may also notice that, as he recoils, a boom microphone shadow appears on the back wall of the cockpit. Look carefully, and you’ll also observe that Trent’s co-pilot is holding a copy of the script in his lap. Both of these gaffes were created when Plan 9 was converted to a film and TV-friendly format. Neither the script nor the boom mike shadow appeared in the original theatrical version. Unfortunately, the aspect ratio changes made to Plan 9 for its video and TV releases suddenly rendered both of these things visible. 5. THOSE FLYING SAUCERS WERE STORE-BOUGHT TOYS. It has been suggested that Wood made his economical-looking spaceships out of hubcaps, pie tins, or dinner plates. But actually, they were just UFO model kits someone had picked up at a hobby shop. The “build-it-yourself” saucers were part of a mass-produced, 1956 line from toy manufacturer Paul Lindberg. 6. MAILA NURMI (A.K.A. VAMPIRA) DEMANDED A SILENT ROLE. Plan 9 is filled with classic lines like “Future events such as these will affect you in the future” and “All you of Earth are idiots!” (Eat your heart out, Shakespeare!) From start to finish, though, the movie’s biggest star is dead quiet. TV’s first horror host, Maila Nurmi had gotten her big break on the Los Angeles station KABC as “Vampira.” Alluring and ghoulish, the character’s weekly show earned huge ratings during the 1950s. In Plan 9, Nurmi plays a similar role. Yet whereas Vampira had a silky, seductive voice, Nurmi's Plan 9 character (a revived cadaver) never makes a peep. The actress later claimed that Wood had given her some dialogue at the onse, but she didn’t like the material he’d written, so insisted on staying mute. 7. TOR JOHNSON’S PHONY SCARS KEPT MIGRATING. After Inspector Clay (Johnson) is killed off, his semi-mangled corpse rises up and attacks some hapless police officers. For these sequences, makeup wizard Harry Thomas gave the actor some hideous-looking fake bruises. “The scars were created on Tor’s face with cotton spirit gum and collodion,” Thomas said in the 1992 documentary Flying Saucers Over Hollywood: The ‘Plan 9’ Companion. “You have to be careful because sometimes collodion will burn, especially if it’s used over the same area more than once.” Throughout the shoot, Thomas was constantly moving the false scars slightly to the left or right. In doing so, he prevented Johnson from getting any real ones. 8. IT TOOK FANS ALMOST 40 YEARS TO FIGURE OUT WHO COMPOSED THE SCORE. Like most low-budget 1950s flicks, Plan 9 from Outer Space doesn’t have an original soundtrack. Instead, it uses a composite score pieced together from assorted bits of stock music. Music supervisor Gordon Zahler assembled Plan 9’s instrumental tracks on the cheap. Yet, after the fact, he failed to give credit where some was due. Zahler never wrote a complete list of which composers were behind the movie’s various cues, so for decades their identities remained a mystery. But in the early 1990s, historian Paul Mandell combed the archives and tracked down most of Plan 9’s original recordings and was able to recognize almost every piece that Zahler had grabbed. One of these was “Grip of the Law” by Trevor Duncan, which acts as the film’s lively opening credits theme. 9. GREGORY WALCOTT’S SCRIPT NOW DECORATES A BATHROOM. At first, Gregory Walcott (who played Jeff Trent) wanted nothing to do with Plan 9. “I read the script and it was gibberish. It made no sense,” the leading man recalled. Eventually, Walcott swallowed his pride and joined the cast anyway. Little did he know that Plan 9 would overshadow the rest of his career. “I will go to my grave not remembered for … meaty roles that I did for the likes of John Ford or Steven Spielberg, but as the leading man in a film most historians consider the worst movie ever made,” Walcott lamented in 1998. Still, he did come to appreciate this film. When Tim Burton’s biopic Ed Wood (1994) came along, Walcott delivered a brief cameo. Then, in 2013, an Escondido, California brewery called the Plan 9 Alehouse opened for business. Walcott helped out by letting the owners use pages from his original Plan 9 script as wallpaper in their men’s room. 10. ONE SNAIL MAIL CONTEST RESCUED THE MOVIE FROM RELATIVE OBSCURITY. The Medveds would soon redeem themselves. The Fifty Worst Films Of All Time invited readers to nominate their pick for the most inept motion picture in the history of cinema. More than 3000 ballots were cast and Plan 9 won the vote by a landslide. When the Medveds published 1980’s The Golden Turkey Awards (another sort-of tribute to B-grade cinema), they pronounced Ed Wood’s masterpiece “the worst movie ever made.” Ironically, this was the best thing that ever happened to the film.